We got lots of replies in response to the announcement about YODA. Several people asked to see how YODA works, so below is a screenshot of the giving form. Q: Are there refund costs? Q: Are there any monthly minimums? Q: After a person makes a donation, where does the money go? Will we need to use our bank account or is it like paypal where the money is held there and we can request the money then be sent to our checking account? It’s kind of like PayPal except you don’t have to request the money be sent to your bank account. When a supporter makes a donation (or a recurring donation is made), the money is held for 2-7 days (depending on the type of transaction) by the transaction processor and then it is automatically transferred into the bank account you designate. Q: Is this a viable alternative to PayPal? Yes. It’s a better option than PayPal because 1) it’s easier to use than PayPal, 2) it gives supporters the option to donate from a bank account (can’t do that with PayPal), and 3) donations are automatically transferred to your bank account without you having to repeatedly request them. Q: How does the Kiosk Giving work? Where is the Kiosk? Every tablet, laptop, or desktop computer instantly turns into a giving Kiosk. Enable giving for your members and visitors as they enter or leave your building, fellowship with their friends, or enjoy a cup of coffee in the cafe. Q: What is the optional text option? How does this work? Your organization gets its own giving phone number. The first time someone wants to use text-to-give, they text “give” to your number. They get an automated text reply with a link. They tap the link and enter their payment info. In the future, anytime they want to give, they just text the amount to your giving phone number (e.g. “50” to give $50). Cost to add this option is $19/mo. Q: Is YODA available only to OurChurch.Com site owners or is it available to everyone? Yes, the offer is only available to organizations whose websites we host. If you have a website hosted elsewhere and you’re considering a new website, now would be a good time to do it. Can I answer any questions for you about our WP-EZ Website Builder or would you like to schedule a call to discuss a custom designed website? 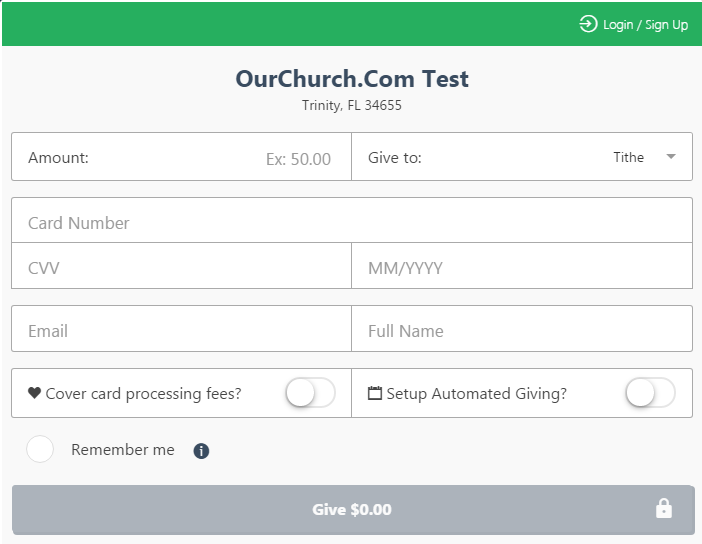 Q: Will YODA integrate with my church management system or client management system so donations are added to members/supporters giving statements? All transactions can be exported as .csv (exel) and can then be imported into almost any ChMS (church management system) or CRM (client relationship manager). There is direct integration with some ChMSs and CRMs with more coming. If you want to check on a specific system, call or email our support team.